Why has the Fed been able to produce asset inflation but no price inflation for past 10 years? My guess: lack of union power and globalization are blunting transmission into wages and prices. But I don’t see an easy way to test that hypothesis. In a recent speech, Fed chair Jerome Powell talked about “balance sheet normalization” in terms that strike me as essentially admitting that the Fed is a failure as a central bank. The crisis revealed that banks, especially the largest and most complex, faced much more liquidity risk than had previously been thought. Because of both new liquidity regulations and improved management, banks now hold much higher levels of high-quality liquid assets than before the crisis. 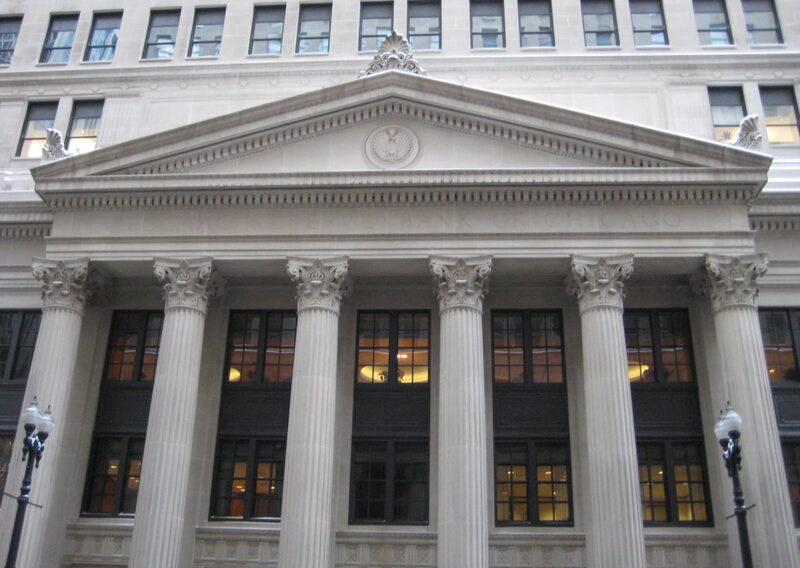 Many banks choose to hold reserves as an important part of their strong liquidity positions. Powell seems to be suggesting that banks have chosen to treat reserves in the same way a gold-standard bank treated specie: as cash on hand to meet demands from depositors who want their money back. I call this a failure because a big part of the reason behind the creation of the Federal Reserve was that this system—where every bank held some gold—was clearly inadequate. Commentators at the time likened it to a fire protection district which, instead of having a fire engine, required every household to have one bucket of water on hand. By having a large common stockpile of gold at the Federal Reserve, a loss of confidence in any one bank could be easily handled. Faced with a bank run, a solvent but illiquid bank would bring some assets (loans, bonds, bills, etc.) to the discount window and receive enough gold to handle redemption requests. Powell is saying that banks seem to have decided that they can’t count on the Fed to discount their illiquid assets—a basic function of a central bank. Instead they’re choosing to stockpile large quantities of reserves exactly the way nervous banks stockpiled gold reserves in the pre-Fed days. I’m sure this is based on the experience of the financial crisis, where many banks held a bare minimum of reserves and safe assets, choosing instead to invest the maximum amount in complex derivative instruments, which were highly profitable until they suddenly became worthless (or at least of dubious value). As a lender of last resort it can’t be counted on to provide reserves to a solvent but illiquid bank. As a regulator it can’t be counted on to require that the banks hold enough high-quality assets with sufficiently transparent valuations to be usable at the discount window. By paying interest on these reserves, the Fed is enabling this behavior—solving the old problem that “gold in the vault pays no return.” But banks should be in the business of facilitating commerce in the economy, not the business of using their depositor’s money to score some free cash from the Fed. I completely understand the Fed not wanting to again put itself in the position of having to decide what discount rate is the right one to apply to 3rd tranche mortgage-backed subprime paper. But a strategy of “just hold more reserves” is a pretty poor solution to the problem, for exactly the same reason that “just hold more gold” was a poor solution in the pre-Fed days. My insurance company can’t quite get my healthcare.gov application processed in time to bill me before the end of the year. But the law only guarantees coverage if I make the first payment before the end of the year. So every year I have to track down the amount and scramble to make a payment despite not having a bill. But now I have done so for next year. Phew. Even though I have several other things going on, it’s indisputable that I’m going to have to write something for this short story contest. I simply can’t imagine a theme that hits more squarely in the sweet spot of what I’m interested in: Into the Black. In 5,000 words or less, we want you to explore the impacts of a basic income on individual lives and on society at large. If it’s your sort of thing, you should probably write a story too. Pay is good, even if don’t win the grand prize ($12,000 paid as $1,000 a month for a year). I don’t normally suggest a soundtrack for posts, but for this one I recommend that you listen to Da Vinci’s Notebook singing “Kingdom in the Sky.” Open that link in another tab and let it play while you read. 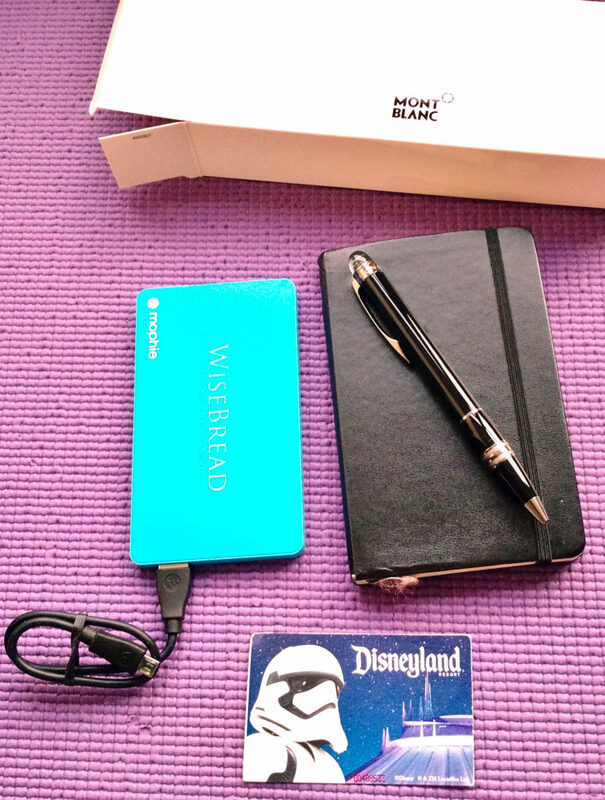 For almost ten years now I’ve been writing about personal finance and frugality for the website Wise Bread. A few months ago, the founders emailed the senior writers to say that to celebrate their 10-year anniversary they were inviting all of us who started in the first year, together with our families, to Disneyland. What a great gift! Jackie and I flew out last week, spent two nights in the Disneyland hotel, and spent two days in the theme parks. Even better than the theme parks was the chance to meet the admins, some of the other writers, and the Wise Bread staff! These are people I’ve been working with for 10 years, but had never met except through their posts and email messages. We also got a pair of 2-day hopper passes for visiting the theme parks! Around the middle of the evening, Lynn (one of the founders) called me to join her closer to the middle of the table so she could make a little speech thanking all us writers for joining Wise Bread and sticking with it all these years, and giving us each a “gift appropriate for a writer” which turned out to be the Mont Blanc pen in the photo above. What a generous and appropriate gift! 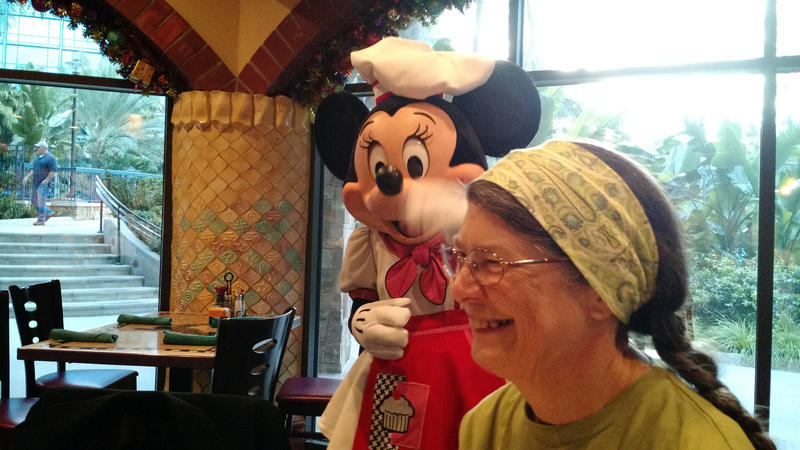 The next morning was breakfast at Goofy’s Kitchen—a breakfast buffet with Disney characters posing for photos and parading through the dining rooms. We sat at the same table as Will, who had some very kind things to say about me to Jackie. Jackie in Goofy’s Kitchen, with Minnie. We spent the rest of the morning at the Disneyland theme park (having done the California Adventure theme park the previous afternoon). 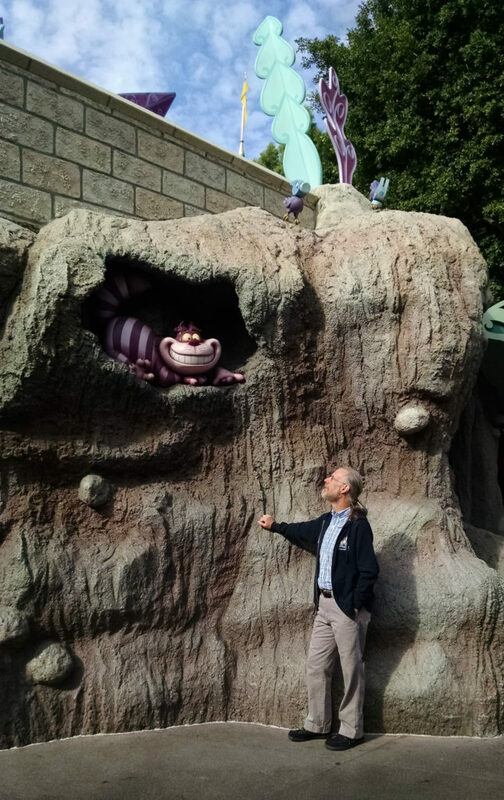 Me in my Wise Bread/Disney hoodie with the Cheshire Cat in Disneyland. Photo by Jackie Brewer. 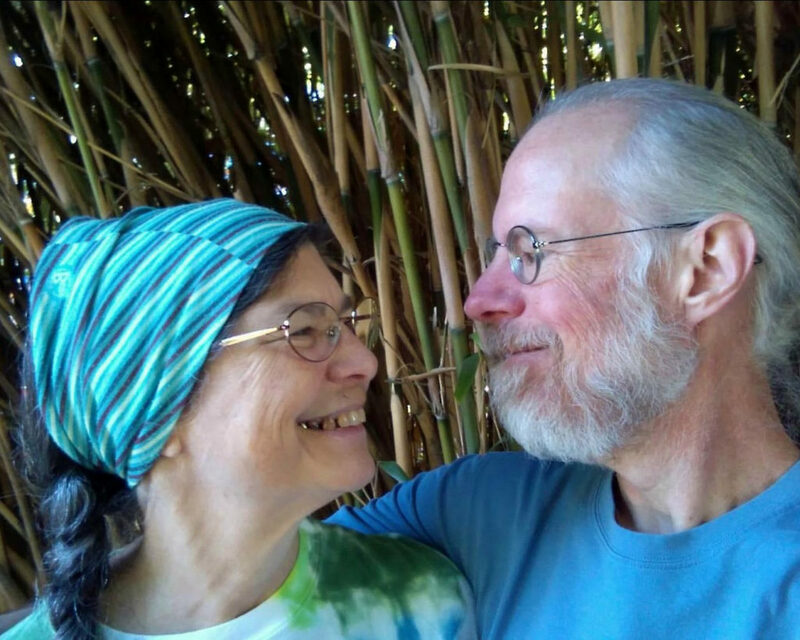 After various rides and attractions and lunch (and a good bit of walking—important to Jackie and me), we decided that we were about theme-parked out, and decided to spend the warm part of the afternoon walking in the gardens outside the hotel and sitting by the pool. Jackie wrote some postcards. How much fun were Jackie and I having at Disneyland? This much fun. Thanks to the admins at Wise Bread! Hey, shall we do our 20th anniversary celebration at EPCOT? The “gig” economy: all the sorts of work arrangements where you’re not a permanent employee and can’t expect that work one day implies that you’ll have work the next day—freelancing, contracting, temp work, casual labor, and most recently, software-mediated contract work like Uber driver. all of the net growth in aggregate employment in the decade leading up to 2015 can be accounted for by contingent work arrangements, which means there has been no net employment growth in traditional work arrangements. promote effectively the goals of maximum employment, stable prices and moderate long-term interest rates. So this raises the question: Does strong growth in the number of freelancers, on-call temps, and Uber drivers mean that we’re getting closer to maximum employment? Or, that we’re getting further away? This sort of thing was a fantasy of mine, back in the 1980s. I could see things getting worse in the US, and the idea that a foreign passport and foreign residency could provide an escape if things got too bad was pretty appealing. Nowadays not so much. It’s not that things have gotten better in the US; it’s that things have gotten worse other places at least as quickly. More to the point, things getting worse in the US seems to make things worse other places, so the conditions that make the idea appealing are the same conditions that make it pointless. One book that substantially influenced my thinking in this area is Emergency: This book will save your life by Neil Strauss. I recommend it highly. In entertaining and informative prose, he documents his transformation from just the sort of kook I was in the 1980s into somebody with a much more practical perspective. 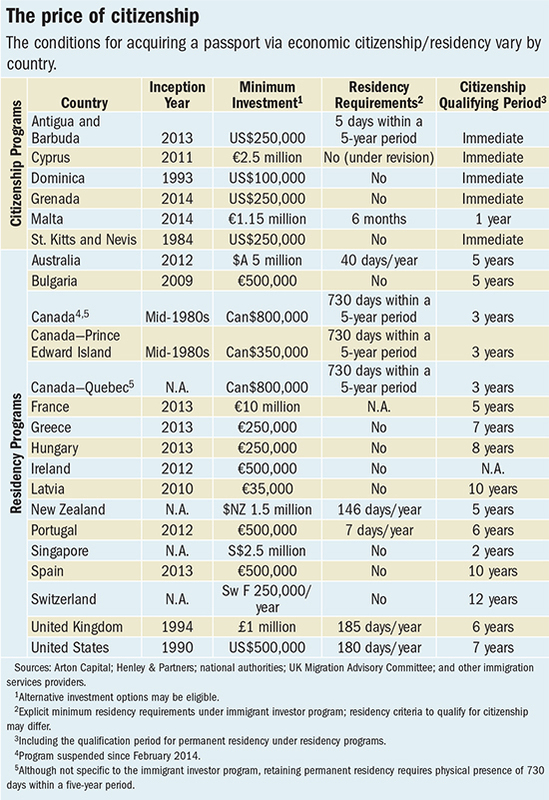 Graphic from Citizenship for Sale on the International Monetary Fund’s IMFDirect blog. So, the Champaign City Council legalized backyard chickens a while back. You have to file a form, pay a one-time fee, and get a notarized permission slip from your landlord (if you’re a renter), but it all looks quite doable. As I’d mentioned when I wrote about the issue before, this would have been a determining factor in my willingness to buy a house in Champaign, and now it isn’t. The fee isn’t cheap ($50), but figured into the cost of buying a house, it’s insignificant. But thinking about the fee got me to thinking about why one raises chickens in the first place. Probably most of the people in Champaign who want to raise backyard chickens are yuppy locavore types looking to reduce their food-miles to minimize their carbon footprint and know that they’re eating organic and cruelty-free. More power to them. 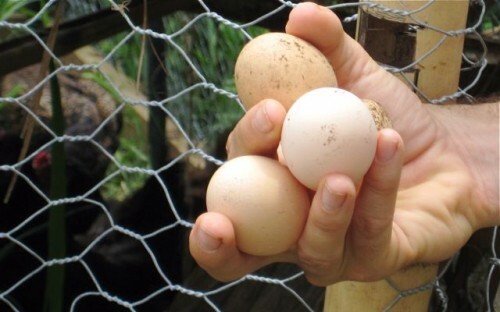 But there’s another category of people who might raise backyard chickens: poor people. Someone who’s poor—someone whose budget barely stretches to cover their other expenses, someone who’s on food stamps, someone who uses a food pantry—is another person who might find raising backyard chickens very attractive. Eggs don’t cost much, but someone who raised chickens might be able to save a few dollars a week and get some high-quality protein and have a surplus that they could share or trade. But a $50 entry fee just about blocks this reason to raise chickens. I guess I’m not really surprised. Local politicians in Champaign have a lot of incentive to help upper-middle class people eat local and organic—those people vote. They probably don’t feel the same pressure to help poor people get a little high-quality food as cheaply as possible, because poor people don’t vote as much—and when they do vote, the legality of backyard chickens probably isn’t a top issue. It does bug me just a little that Champaign (which thinks of itself as conservative place) has created this whole big-government scheme with forms and approvals and fees and regulations on chicken coops, while Urbana (which thinks of itself as a liberal place) doesn’t have any of that stuff, just a general rule against letting your animals become a nuisance. But that’s just me, asking for consistency from politicians. So, half a cheer for Champaign legalizing backyard chickens, even if they came up with a way to do it that only helps yuppy locavores and not poor folks. How is 2% inflation different from 3% or 4%?
. . . what calculation leads to the notion that a target of “close to but less than 2%” is appropriate, as opposed to, say, 3 or 4 percent. I think I know the answer: An inflation rate of 2% is small enough that price changes due to inflation are unnoticeable in the noise of other price changes, even over periods of a few years. Among the costs of inflation are those that come from uncertainty about not only future prices, but also about current prices. When inflation is under 2%, the price of a cookie at the local bakery might remain unchanged for years at a time. I can stop by the bakery with exact change, and be reasonably confident that I’ll be able to buy one. The costs of flour, sugar, and chocolate will vary over time—but some will rise and others will fall, and the bakery will be able to hold the line on the price of a cookie. This is a convenience for me. It’s also good for the bakery, because people who are confident that they have enough cash in their pocket to buy a cookie are more likely to stop and get one. If they had to make a stop at the ATM first to get cash—or worse, be sent away to visit an ATM mid-transaction—they might not. At some point—and I assert that the point turns out to be slightly above a 2% inflation rate—stores find that it’s necessary to raise prices at least annually, just to keep up with inflation. Even if the inflation rate is known and not a surprise, there’s still the threshold effect of one day the price is $x and the next day it’s $x+3%. When the inflation rate is below 2%, prices can remain stable for years at a time—long enough for people to learn what they are. And that knowledge can make their day run more smoothly. They can be sure they have appropriate cash on hand. They don’t need to check prices ahead of each transaction. When the inflation rate is above 3%, stores might need to raise prices twice a year, to avoid falling behind. When the prices of a hundred things are all being raised more often than annually, it becomes impossible to learn what prices are, and impossible for that knowledge to make the day run more smoothly. All of a sudden, you have to pay attention to price changes, because they’re happening all the time. In advance of every transaction, you need to allow for the fact that maybe today is the day that prices went up several percent. Some prices change all the time anyway, especially where the item being sold is a single commodity, such as milk or gasoline. For exactly this reason, prices of those items are often prominently displayed—to reduce the transaction effort of the consumer who wants to know what the price is going to be. I think that’s why 2% inflation is different from 3–4% inflation: Because price changes due to inflation begin to stand out from changes in relative prices, adding another whole layer of informational costs on every purchaser, on every purchase. Savoy has needed a coffee shop for a long time. As coffee shops go, this donut place seem okay. One household in this neighborhood doesn't put herbicide on their lawn. Can you guess which one? Thanks to Steven for telling me how using the Pixel 2's portrait mode got the camera to focus on a small foreground figure. The weir was dry, but covered with branches and twigs. I cleared the ones blocking the weir itself, but didn't try to get the stepping stones clear. Jackie made me this smashing bandana a couple of years ago, but I think this is the first time I've worn it.